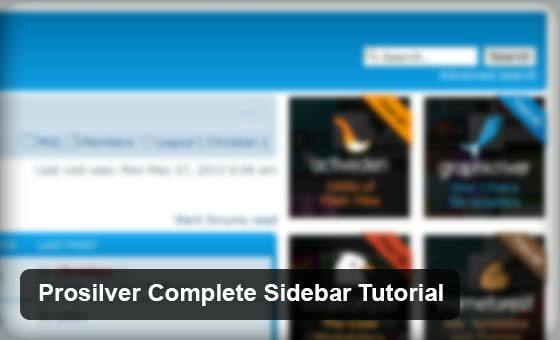 Description: Learn how to add highly flexible sidebars to your forum. For Prosilver & Prosilver-based Styles. Following this tutorial will install 6 different sidebar variations to your forum (left, right, both, index-only, global) easily switchable with one line of code. All sidebars are tableless, cross-browser tested and validate as xHTML 1.0 Strict. To keep our template files clean and free from clutter we’ll import our sidebar code from their own template files. Repeat this process to create sidebar_right.html. You should now have two sidebar files: sidebar_left.html and sidebar_right.html. Move these to Prosilver’s /template/ folder. Firstly, we’re going to input the variables that you’ll be using to control the sidebars. We’ll cover this in more detail later. Now we need to remove the #page-header div. It doesn’t actually do anything and its presence causes problems with the sidebar tags closing early. Now we’re going to add our sidebar structural code. And of course, for every tag that we open it must be closed. Luckily we’re not actually editing any CSS. Just adding some new lines to set out the structure and help with styling. both: Sidebars will appear on both left and right sides of the forum simultaneously. off: No sidebars will be displayed. There are further options available for Administrators that wish to restrict pages the sidebar is shown on. global: Sidebar(s) will display on every page of your forum, including User Control Panel and Login pages. index: Sidebar(s) will only display on the forum index page. It’s very likely that you’ll wish to adjust the sidebar widths to accommodate your own advertising requirements. Due to the tableless nature of the sidebars adjusting widths is delicate and tricky. Essentially it’s important to remember that when a sidebar width is edited, the content side of the forum’s width must also be adjusted. So if you increase the width of the right sidebar by 10px, the width of the left side must be reduced by 10px. To increase the width, we’d simply replace 260px with a larger value such as 300px. Keep in mind that we’ve now increased the width by 40px. Here’s where things get a little confusing. To reduce the left side’s width, we actually need to increase the right padding value. The right padding value increases the distance between the right side of the forum and the browser. The sidebar floats over the white space this leaves. So we’d replace the 270px with 310px (270px + 40px). If you’re seriously confused by adjusting the widths let me know. As covered way back in Step 1, the sidebar content is pulled from template files. Sidebar_left.html populates the left sidebar whilst sidebar_right.html populates the right sidebar. Please let me know if you have trouble with anything in the tutorial. It’s very likely that in the future I will write a secondary article that focuses specifically on resizing sidebars etc. Future versions of this tutorial will also add support for users to collapse sidebars, and give the admin a finer level of control of which pages sidebars are displayed on.